Earnings Forecast Downgrades is a short selling and red flag strategy identified in a research paper by academics Philipp McKnight and Steven Todd, called Analyst Forecasts and the Cross Section of European Stock Returns. It looks for stocks experiencing earnings forecast downgrades by analysts as a potential trigger of negative momentum. They found that the positive returns from an earnings upgrade portfolio were large and persistent, whereas the sell portfolio generated a near zero return because bad news was quickly 'priced-in'. While the strategy on its own may be difficult to profit from, it still highlights stocks that should perhaps be avoided, or warrant careful additional research. McKnight and Todd wrote: "We find differences in the return continuation patterns of stocks with upward versus downward revisions, namely, bad news travels quickly, but good news travels slowly." American born financial theorist and university professor. 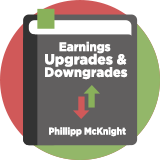 Research on European stock by Todd & McKnightwork found that the positive returns realized on a earnings upgrade portfolio were large and persistent, whereas the sell portfolio generated a near zero return, i.e. the bad news was quickly priced in whereas the good news diffused slowly. This may be because conflicts of interest encourage analysts to report overly optimistic earnings, and investors, aware of these biases, respond by being cynical and adopting a “wait-and-see” approach when it comes to good news.